The first week of February 2016 will see the eyes of the world focused on the San Francisco Bay Area for Super Bowl 50 on February 7, 2016. If past Februarys, and the recent impacts of El Niño, are any indication, the odds are pretty high of that some of the outside activities will be wet. During the first week of February, over the past 49 years, it has rained on average two days with an average rainfall amount of 0.81 inches at San Jose Airport, just 3 miles away from Levi Stadium in Santa Clara, CA. That rained occurred on 37 of the 49 weeks, or 76% of the time. 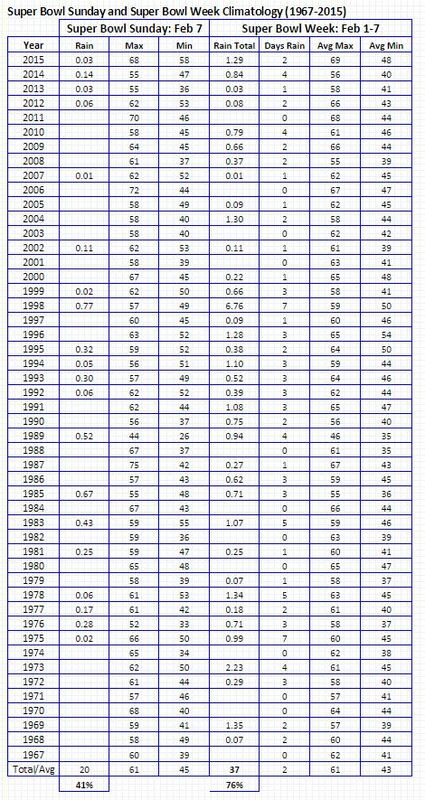 It is also interesting to note that the two wettest Super Bowl Weeks were during the strong El Nino events of 1997-98 (6.76") and 1972-73 (2.23"). Over the past 49 February 7ths it has rained 20 times, or 41% of the time. And on those occasions the average rainfall has been 0.22 inches. The last time the Super Bowl was played in the San Francisco Bay Area was Super Bowl 19 on January 20, 1985. That day was clear, cool and crisp with a high temperatures of only 52 degrees. And the San Francisco 49ers beat the Miami Dolphins, 38-16. The average high temperature during the 1st week of February is 61 degrees and the average low is 43. How Much Rain Is Needed to End the California Drought? How Much Rain Do We Need to End the California Drought? A simplistic way to look at the water shortage in California is to look at the rainfall deficits around the state from the past four seasons, and then add in the current rainfall season. In doing so (see table below) the deficits range from almost two times normal to about three-and a half time normal. 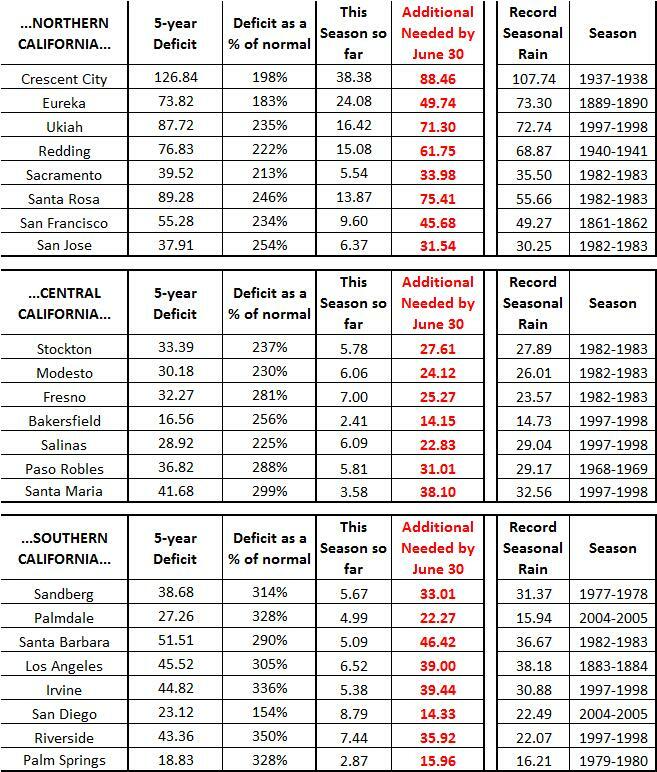 Or to look at it another way, all but Salinas would need an all-time record rainfall year to erase the 5-year deficit. Also included on the page is a link to the Excel spreadsheet (with instructions) that you can use to create the seasonal summary yourself if I am unable and/or you are impatient. Enjoy! Many headlines in recent days have been touting the current and upcoming rain as the first El Niño storm(s) of the year. In reality, every weather system we have seen in California, and elsewhere, have been influenced by El Niño; going back to its strengthening in the eastern tropical Pacific last fall. And every storm will continue to have to some "El Niño DNA" in them, well into spring. The pattern that we saw in December, with a series of colder storms from the Gulf of Alaska, were not as characteristic of El Niño, but they were certainly related as distant cousins. 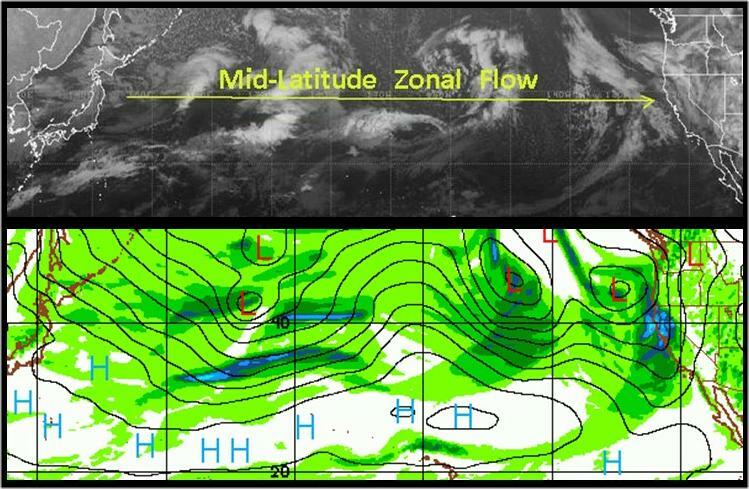 The current pattern, with a series of storms moving almost directly west to east (i.e., zonal flow) across the Pacific in the middle latitudes, is what is more commonly thought of as a "typical" El Niño pattern. This pattern is more closely related to the impact of El Niño on the jetstream pattern in the Pacific; and to extend the familial metaphor are more like brothers and sisters. This is very reminiscent to what we saw in January through March of 1998. It should be noted that during those months in 1998 that while there were lots of rainy days, most of the daily amounts were in the moderate category and not heavy rain days. The December California Summary was highlighted by some stark contrasts in rainfall around the state while temperatures were pretty close to normal. In the SF Bay Area, downtown San Francisco rainfall was 14% above normal while San Jose was 15% below normal. (So the average of the two would be normal?) Elsewhere north of the Tehachapis, rainfall was generally well above normal, with 180% of normal at Eureka, 168% at Fresno and 131% at Redding; but Sacramento was the outlier with only 50%of normal. 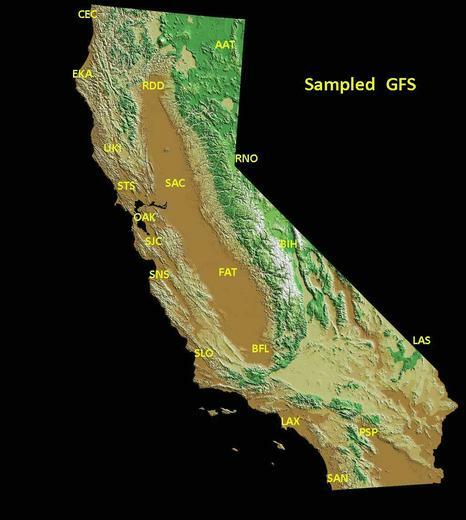 I have put together a simple map interface to access the "sampled" GFS for locations around California. See http://ggweather.com/gfs.htm. While the GFS is not always the best model,especially out past about 5 days, the sampled data gives a good quick "first guess". For example the "Total Precip" column is an easy way to see the timing of an approaching system. And if any of the values on the page are underlined, you can click through to see the associated charts. Previous QPF amounts can also be compared at http://wxweb.meteostar.com/sample/compare_qpf.shtml?text=KOAK. The QPF page has been updated and hopefully all the links are working. Lots of rainfall and river resources to be aware of and hopefully used often in the coming months. On almost as regular basis as the swallows returning to San Juan Capistrano an extended period of dry weather likes to return to Northern and Central California in the middle of winter. Based on San Francisco's daily rainfall, over the past 65 rainfall seasons (i.e., July 1 to June 30) there has been a "dry" period in December or January averaging 20 days. For practical purposes a "dry period" is defined here as consecutive dry days with no rain, or consecutive days broken by no more than two non-consecutive intervening days of very light (* i.e., ≤ 0.08 inches) rain]. The average dry period during seasons with an El Niño was 17 days, while the average rose to 19 days during "ENSO neutral" years and 21 days during La Niña. The shortest dry spell was 8 days which occurred twice, in 1957-58 and again in 1994-95. Both of these seasons were during El Niño events. The longest dry spell was 56 days in 2014-2015, when there was 18.19 inches. All of these dry periods began in December or January with the exception of the 1964-65 period which was 19 days but did not begin until February 6th. Even the very wet El Niño seasons of 1982-83 and 1997-98 had intervening dry spells and 22 and 17 days respectively. The bottom line is that an extended period of dry weather is the rule and not the exception in the middle of almost every winter as the atmosphere settles into a two to three week period of equilibrium dominated by high pressure. In recent weeks a number of jobs for meteorologists in the SF Bay Area have crossed my desk that I thought I would share. See below. We are looking for a candidate with superb programming ability as the job will require at least half time building/maintaining data acquisition/dissemination and data-visualization systems. This position is located in the National Weather Service Division of the National Ocean and Atmospheric Administartion. We are currently recruiting for several positions at Sonoma Technology, Inc.
Air Quality Forecasting and Public Outreach. STI meteorologists issue daily weather and air quality forecasts for over a dozen cities across the U.S. These forecasts are disseminated to air quality agency websites and local and national media. STI meteorologists also develop forecast tools and provide forecast training to agencies worldwide. Working with the U.S. EPA to Expand AirNow-International. AirNow-International is a suite of state-of-the-art software programs based on the highly successful AirNow program (http://www.airnow.gov/). AirNow-I facilitates air quality management and promotes public awareness of air quality issues. The first implementation of the system was completed for Shanghai, China, in advance of the 2010 World Expo<https://www.youtube.com/watch?v=joljzDtA7FA>. It has since been expanded to other parts of China and Mexico. Weather Research for Wind Energy. STI scientists are working with U.C. Davis to improve meteorological forecasts to support real-time wind energy production decisions. As part of this project, STI staff have deployed and are now operating instruments (sodars, ceilometers, radar wind profilers, and microwave radiometers) to continuously measure meteorology in the lower troposphere. Data from these instruments will be used to improve the physical parameterizations in the weather forecast models and improve initial conditions for input into the model. Air Sensor Monitoring Program for Kids. STI is developing the Kids Making Sense<http://www.kidsmakingsense.org/> program, which enables youth to perform air quality measurements and empowers them to drive positive change in their communities. I look forward to any questions or comments you may have about our company, projects, and staff. Sr. Vice President, Meteorological and Air Quality Operations and Measurements Sonoma Technology, Inc. I hope this email finds you well. I came across your information on LinkedIn and I was inquiring if you would have any interest in hearing about a Google - Project Loon - Atmospheric Scientist (https://youtu.be/OFGW2sZsUiQ) opportunity that I have available in the Mountain View, CA area? This is a contract to hire position, six months with potential to convert to full-time. Project Loon requires an Atmospheric Scientist's expertise in order to steer its balloon network through the Stratosphere. The goal of this project is to improve short, medium, and long-range weather forecast capabilities in support of Project Loon. • Previous employment or experience with NOAA/ECMWF/NRL/NASA, etc. If you are interested and would like to see the position description please email me back and I will gladly send you the description. Is this storm El Niño? Or is it the next one? Is this storm El Niño? Yes and No! Every storm from now through winter and into spring is to some degree being influenced by El Niño. 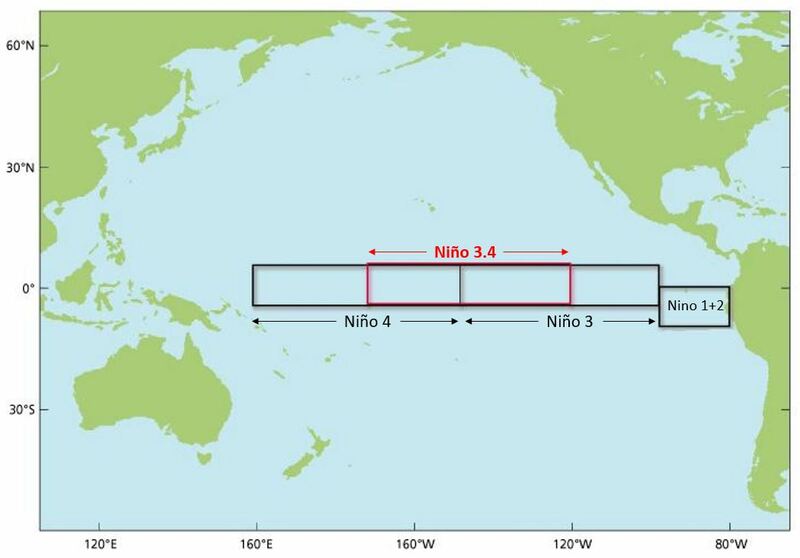 The conditions that define this strong El Niño are already in place across the eastern tropical Pacific. There are some winter weather patterns that are influenced more by this and thought of as more "typical" of El Niño, but even a cold front from the Gulf of Alaska is to some extent being impacted. The same can be said for every storm being influenced by the fact it is winter, with the tilt of the earth and its position relative to the sun being different than in summer! Consequently, there is no way to look at one storm (or any other weather event) and say it is or is not because of El Niño. We get storms every winter anyway and there is no DNA test to say that it is only happening because of El Niño. Which El Niño Index is Best? The November monthly Sea Surface Temperature Anomaly (SSTA) in Niño 3.4 region was a record +2.35, while the 3-month Oceanic Niño Index (ONI) for September-October-November is +2.04, second to a +2.18 for the same period in 1997. So, is this the strongest El Niño on record or not? How about the monthly SSTA from December 1877 of +2.51? In reality they are all correct as there is really no “best” metric. One may have elements that best describe a particular season in a particular location, while another may have the best teleconnection for a different time and place. A variety of different metrics are used to characterize El Niño; ranging from sea surface temperatures (SST) to sea-level pressure, surface winds, surface temperature and out-going longwave radiation. These are usually expressed in the form of an index; often in terms of the difference from long-term average (i.e., anomalies). Even indices based upon the same metric, like SST, may use different datasets, sampling periods (i.e., weekly, monthly, bi-monthly or tri-monthly) and/or different filtering techniques. The Niño 3.4 region (map) has arguably the best teleconnections to seasonal weather in the United States and is widely used as a sampling area for SSTAs. The Oceanic Niño Index (ONI), is the mostly widely used index in the United States to characterize El Niño events. The ONI is the 3-month SST Anomaly (SSTA) for Niño 3.4 and calculated from moving 30-year average values. See http://ggweather.com/enso/oni.htm and http://www.cpc.noaa.gov/products/analysis_monitoring/ensostuff/ensoyears.shtml. The Niño 3.4 region SST is also sampled on both a monthly (http://www.cpc.ncep.noaa.gov/data/indices/ersst4.nino.mth.81-10.ascii) and weekly (http://www.cpc.ncep.noaa.gov/data/indices/wksst8110.for) using the ERSST4 dataset back to 1950. There is also monthly Niño 3.4 data going all the way back to 1870 using the HadISST1 dataset (http://icdc.zmaw.de/1/daten/ocean/hadisst1.html). The Southern Oscillation, which was identified by British mathematician Sir Gilbert Walker in the early 1900s, is a periodic "see-saw" of pressure patterns in the tropical Pacific. This pattern was later linked to occurrences of El Niño and is the SO part of the combined acronym ENSO for El Niño Southern Oscillation. It is usually expressesed as the standardized Southern Oscillation Index (SOI). See https://www.ncdc.noaa.gov/teleconnections/enso/indicators/soi/. The El Niño Modoki (translated from Japanese for "similar but different") Index quantifies ENSO events that are warmer in the central Pacific than the typical El Niño warming in the eastern Pacific. See http://www.jamstec.go.jp/frcgc/research/d1/iod/enmodoki_home_s.html.en. And the Multivariate ENSO Index (MEI) brings together six different elements (sea-level pressure, zonal and meridional surface wind, sea surface temperature, surface air temperature and total cloudiness). See http://www.esrl.noaa.gov/psd/enso/mei/. An excellent technical analysis of these various indices by Anthony Barnston of IRI can be found at https://www.climate.gov/news-features/blogs/enso/why-are-there-so-many-enso-indexes-instead-just-one.